Rick Hanson, Ph.D., is a neuropsychologist and author of Hardwiring Happiness, Buddha’s Brain, Just One Thing, and Mother Nurture. Founder of the Wellspring Institute for Neuroscience and Contemplative Wisdom, and an Affiliate of the Greater Good Science Center at UC Berkeley, he’s been an invited speaker at Oxford, Stanford, and Harvard, and taught in meditation centers worldwide. He has several audio programs and his free Just One Thing newsletter has over 95,000 subscribers. "Rick Hanson is a master of his craft, showing us a wise path for daily living in this book. Based in the latest findings of neuroscience, this book reveals that if we understand the brain a little, we can take care of our lives a lot, and make a real difference to our well-being. Here is a book to savor, to practice, and to take to heart." "The cultivation of happiness is one of the most important skills anyone can ever learn. Luckily, it’s not hard when we know the way to water and nourish these wholesome seeds, which are already there in our consciousness. This book offers simple, accessible, practical steps for touching the peace and joy that are every person’s birthright." "In this remarkable book, one of the world's leading authorities on mind training shows how to cultivate the helpful and good within us. In a beautifully written and accessible way, Rick Hanson offers us an inspiring gift of wise insights and compassionate and uplifting practices that will be of enormous benefit to all who read this book. A book of hope and joyfulness." "I have learned more about positive psychology from Rick Hanson than from any other scientist. Read this book, take in the good, and change your brain so that you can become the person you were destined to be." -Robert A. Emmons, Ph.D., Professor, University of California at Davis, Editor-in-Chief, The Journal of Positive Psychology, author of Gratitude Works! and Thanks! "Hardwiring Happiness provides the reader with a user friendly toolkit to expand feelings of happiness and to functionally erase the profound consequences of negative memories and experiences." "Learning to take in the good is like fully and mindfully breathing in life: it allows us to access our inner strengths, creativity, vitality and love. In his brilliant new book, Rick Hanson gives us the fascinating science behind attending to positive experiences, and offers powerful and doable ways to awaken the deep and lasting wellbeing we yearn for." "Hardwiring Happiness teaches us the life-affirming skills of inverting our evolutionary bias to hold on to the negative in our lives and instead soak in and savor the positive. What better gift can we give our selves or our loved ones than an effective strategy to increase joy through brain-based steps that are both accessible and pleasurable? Bravo"
"Truly helpful and wise, this book nourishes your practical goodness and feeds the vitality of your human spirit. Following these practices will transform your life." "Dr. Hanson has laid out an amazingly clear, easy, and practical pathway to happiness." "Rick Hanson is brilliant at making complex scientific information about the brain simple. For anyone wanting to decode the black box of the brain and take advantage of its potential, this is the book to read." "I happened to be reading Hardwiring Happiness while my mother was dying in hospice. Following the instructions in the book, there was a healing that transformed my experience of my mother's dying. This was the right book for the right moment, and I am deeply grateful for it." "With current neuroscience to back him up, Rick Hanson has given us an incredible gift. The practices within this book don’t take much time at all, yet have the potential to yield true and lasting change." "Dr. Hanson offers a remarkably simple, yet transformative, approach to cultivating happiness. He provides clear instructions for bringing these insights into challenging areas such as parenting, procrastination, healing trauma, and transforming relationships. This book is a gift, one you will want to read over and over and share with your friends." "Seamlessly weaving together insights from modern neuroscience, positive psychology, evolutionary biology, and years of clinical practice, Dr. Hanson provides a wealth of practical tools anyone can use to feel less anxious, frustrated, and distressed in everyday life. With humor, warmth, and humility, this book combines new research and ancient wisdom to give us easy-to-follow, step-by-step instructions to live richer, happier, and more loving lives." "Rather than offering simplistic positive thinking, Dr. Hanson's synthesis of the new science of the brain is realistic and practical. Stop needless suffering, take in the good with his HEAL formula, calm down and green your brain, and flip the switch. We all need Hardwiring Happiness as a wise, daily practice." "Dr. Hanson shows us, in compelling prose sprinkled with humor, how we can learn to “re-wire” our brain, so that we can respond to the world in a receptive mode, one resting in peace, contentment, and love. I can’t imagine a better prescription for our troubled world!" "Always on the cutting edge, Rick Hanson is brilliant at making the neuroscience of happiness accessible, engaging, and practical. If you're looking for greater happiness, more fulfilling relationships, or greater peace of mind, this book is a treasure." "In a lively and lovely voice, Rick Hanson offers an inspiring, easily accessible guidebook to living happily." "Why should you read this over any other happiness or mindfulness book? Because the prose, stories, and concrete strategies are beautiful, lucid, and most importantly, they work. I cannot remember the last time a book brought me peace of mind as quickly and effectively." -Todd B. Kashdan, Ph.D., Associate Professor, George Mason University, author of Curious? "Carefully explaining both the neurobiology and practice of happiness Dr. Hanson writes simply enough that anyone can use this book as a primary resource to bring more joy and less stress into their lives." "Just as a journey of a thousand miles begins with a single step, a life filled with joy and contentment is created "a dozen seconds at a time," as Rick Hanson shows us in this game-changing book. Hardwiring Happiness is an essential guide to finding peace and joy in our busy modern world--happiness that is not dependent on external or material conditions, but that is an essential part of who we are, no matter where we are or what we have. I can't stop thinking about the implications of this book." "Dr. Hanson provides an exceptionally clear and compelling explanation as to why we tend to focus on what's wrong far more than what's right. If you want to shape your own brain for the better and make feeling good a reflex, get this book and absorb its wisdom!" "This deeply intelligent, beautifully written book weaves current neuroscience together with ancient and contemporary wisdom, and then translates these brilliantly into deceptively simple yet highly effective practices that really make a big difference – I know because I’ve done them." "Hardwiring Happiness demonstrates powerfully how a series of small steps brings about big changes." "The author weaves together the rigor of science, the beauty of art, the wisdom of reflection, and decades of clinical experience to offer us one of the most exceptional books on how to cultivate greater happiness and well being in our lives." 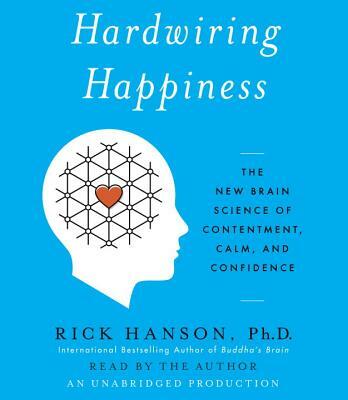 "In Hardwiring Happiness, Dr. Rick Hanson has given us an instruction manual for creating new brain patterns. This ability, once mastered, can change your life. And he does it all with a gentle humor and kindness that shines throughout the book." "This book is a gem. I recommend keeping it on your bedside table and making it the first thing you read each day." "Dr. Hanson clearly and elegantly teaches practices and perspectives that change our lives by changing our brains. If you want a primer for true happiness, this is it." "In this book, the insights of neuroscience become clear, practical, and profoundly transformative. Rick Hanson is the one expert in this realm that I've come to trust completely, and following his guidance is “taking in the good” indeed." "Hardwiring Happiness is a masterful wow, guiding readers to skillfully take charge of rewiring their brains. The benefits will be immediate, the well-being long-lasting, and the process life-changing." "With the compassion and gentleness of a good friend and the rigor and precision of an engineer, Rick Hanson gives you the key takeaways from neuroscience that will enable you rewire your brain for a more joyful life." "I can’t help but fall in love with this book, it is so powerful in its elegant simplicity. Hardwiring Happiness opens us up to the small choices that are all around us to live a happy, fulfilled and resilient life." "Unique in the growing field of neuroscience, Rick Hanson not only explains how the brain works, he gives us the tools to fix it. This book is a toolbox for transformation." "Rick Hanson takes the technical and complicated and makes it simple, even ordinary. In Hardwiring Happiness, he has created an accessible, practical, and user-friendly guide that will help readers enhance their sense of well-being while also interrupting their habitual patterns of suffering." "In this beautifully written book, Dr. Hanson walks us through the principles and practices that lead to transformation. He has an uncanny capacity to find the gems in dry, complex scientific research and combine them with his wisdom, wit, knowledge, and compassion. In Hardwiring Happiness, this results in profound, life changing lessons for us all." "A fascinating exploration of the new science of happiness and how we can learn to shape our own brains." "Hardwiring Happiness is a clear, easy-to-understand, fun and profound roadmap to genuine happiness. If you do the practices, they can change your life. Take in all the good this terrific book has to offer." "An awesome set of instructions for upgrading the mental operating system!" "This book not only explains how to develop essential qualities of peace, satisfaction and connection - but also a sense of hopefulness that we can radically affect our reality and our well being." "Hardwiring Happiness is fantastic--offering us an evolutionary perspective on our brain's built-in negativity bias, and then giving us practical tools for dealing with it. Brilliant." "Here's what I love about Rick Hanson's book: it's practical, it's based on science, and it's full of wisdom. Best of all, it actually works."